All Floor Removal. Done Right. Friends Don’t Let Friends Remove Flooring. Floor Busters All Floor Removal takes pride in being a professional, reliable flooring demolition family owned and operated business since 2015 with over 10 years of experience. 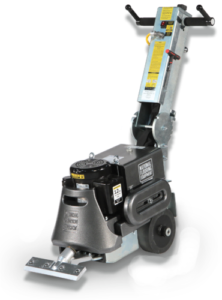 Because of our unique floor scraper machinery, we are able to remove and prep flooring in a fraction of the time which saves homeowner or contractor time and money. We have many long-standing relationships with flooring installers and contractors. On every job dust control and debris removal is important. We specialize in dust control during your floor removal. 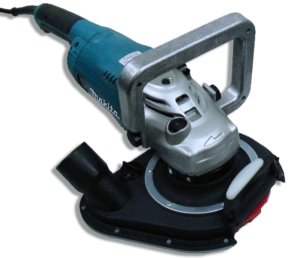 We use dustless grinders hooked up to a HEPI filter that cleans itself every 30 seconds and seal off the work area to contain the dust and keep the rest of the building or home free of dust. The Gladiator removes the worst of today’s hard and soft goods, such as ceramic tile, wood floors, thin-set, sheet vinyl, linoleum, and more. Its compact design makes it ideal for use in confined spaces, while the side slide weights add extra head pressure when forward and improved traction when moved over the back wheels. We use these for the more aggressive work sites. This keeps our work area tidy and minimizes exposure to debris inhalation, keeping us and our job site in a healthy state. A twist-and-click Universal Connector allows easy hookup to a vacuum tube. Amazing people, high integrity, and an amazing work ethic! I would recommend them to anyone I know! So refreshing for a contractor to do what he said he would do! Chris showed up on time (in fact early), got right to work, charged us a reasonable price, did a great job in a short amount of time, cleaned up afterwards, and was friendly and polite. Would absolutely call Chris again and recommend to anyone! THANK YOU FLOOR BUSTERS FOR THE EXCELLENT WORK. Got everything done in one day with an incredible professional matter. Chris and his crew are top notch. I needed emergency floor removal service because of flooding. I called one afternoon and they came and got it done the next day. Thank you all – you are wonderful! Fantastic work and strong work ethic ! My choice for all my floor removal needs ! Awesome job! Would hire you again in a heartbeat. Thanks again! Floor Busters San Antonio is a limited liability company (LLC).